1. The major feature of the AACA is that members can generate and maintain their own online presence, using the tools provided by the AACA, without having any particular technical skills, The service is free for well-featured basic sites, with premium services offered for a fee. The AACA provides a range of features bound to satisfy the needs of virtually all clubs operating at SaddleBrooke Ranch, and free for a large majority of them. 2. The HOA Board determined that the AACA is a Service, not a club, that doesn't use HOA amenities. As such, it will not be listed on the new HOA website. One can surmise that will be true for all services not using HOA amenities. Also, a Board member mentioned that a review needed to be done to determine if other clubs should be reclassified as services. 3. The AACA is independent of the HOA. 4. The AACA plans are to include all organizations (clubs, groups, associations, activities...) so that one will find all that's available at SBR. 5. The HOA will include listings on the new HOA site for all Clubs wishing to be listed. A hypertext link will only be included in a club's listing if it links to the club's website, i.e., opens the club website. 6. There are no links that open "groups" within GroupWorks. To view groups, even their existence, within GroupWorks, one must log into GroupWork; the log in requirement essentially isolates groups from the internet. Per (5) above, links to GroupWorks will therefore not be permitted in club's listing on the HOA site. 7. The AACA includes hypertext links for organizations' listings that link to their websites and to GroupWorks without discrimination. The AACA treats all organizations the same, no matter how the HOA classifies them. 8. The AACA runs on a professionally managed "industrial grade" server with nightly, weekly, and real-time backups being made in several ways and at several locations. For complete details and additional information, CLICK HERE or the title of this item to open the meeting notes. √ View the "Express Site Access" section that tracks each member's history of site access for convenient re-visiting without having to search for the tile in the array. Furthermore, clicking a tile in the Express Site Access section takes one directly to that club's website. √ Assign custom titles to club officials rather than be stuck with those previously assigned. √ Participate in Chat Rooms. 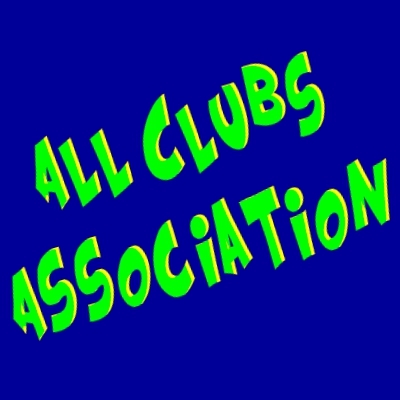 √ Post items of community interest about your club on an "AACA" news feed. ...and other member-only features that may be introduced from time to time. If you have club leaders not included on this email and who you might expect to take part in your website creation activities, please bring them along, and please let me know who they are so I can update my records. To use the website creation and editing tools, one will have to be a member of the AACA because members will have privileged access to those features. Some have already taken the step to become members. It's impossible to pick a time convenient to all, so I expect there will be the need for a second meeting at a TBD time, targeting a date as soon after the first one as possible, on the same topics. I will post a simple sign-up sheet on the AACA site for you to indicate if you will be needing to instead come to a second meeting. Please follow the News on the AACA site for details on AACA goings-on from here on; click the "News" button in the menu strip near the top of the AACA page. I will also introduce the notion of optionally forming small Packs of club leaders ASAP for clubs having similar requirements, not necessarily similar topics, to brainstorm, inspire, and participate in the creativity process in a collaborative way. A first Pack is in the process of forming. Packs are also relevant within your club site in the context of committees, to be discussed in the meeting. Given the recent HOA announcement anticipated for some months, I look forward to having this site work very well for you to get online presence for your clubs. I expect that many of you will find a level of functionality that serves you well at the basic level of features—and free. I expect to follow this meeting with a series of meetings on a feature-by-feature basis, and your decision to attend can be based on relevancy to your plans. I'd like to hear from you if you are interested in some future meetings being conducted on interactive video sessions participating from the comfort of your homes. I'll briefly discuss this option at the meeting. If enough interest, I can begin those following this kick-off meeting. Moreover, the AACA is itself a club having members who enjoy advanced features, notably the ability to create basic websites for free without writing any software, even to offer clubs online presence for those clubs not interested in having a traditional website.The site was renamed the "Access All Clubs Association", or AACA, as it more accurately describes the enhanced functionality of the site; however it continues to support access to websites without change. The added functionality was in anticipation of the expected transition to the Northstar platform, and figures prominently as a solution to clubs' website challenges and expense as a result of the new policy. This is detailed below point by point. In August 2018, Ken Gorman informed Tim Fudge of his plan to retire from developing custom websites for clubs in July 2019. To provide ongoing website support for clubs post-July 2019, he began development of the successor to the SBR Clubs site, the AACA, that would be continue to be accessed by clicking the "Clubs" link on the HOA site. A preliminary phase involved the HOA in the process of "creating clubs" including formation of websites. The HOA made a critical decision in the Fall of 2018, that being to "have nothing to do with clubs". The policy announced yesterday formalizes that decision. The AACA operates independently of the HOA for the specific purpose of providing clubs online presence to facilitate operation of their clubs and promotion of their clubs to all SBR residents and those not yet residents but contemplating moving here. The AACA site coming online the past few weeks provides a smooth transition for clubs. Specifically, those clubs that have website would not need to do anything to their sites with the transition to Northstar. But what about clubs not currently having websites? The AACA provides the means for clubs to create well-featured custom websites at no cost and not involving writing any software. Even sites requiring more advanced features such as resource scheduling and the planned video conferencing tool can implement those features on their own without writing any software whatsoever. This design gives clubs the ability to control content and structure of their sites and maintain them without any technical skills other than one would have to send and read email. -- The new policy states "Clubs will no longer be required to have or maintain a website; this is the choice of the Club." The AACA provides the means to have/maintain their own website. And for those not wishing to have one, to display information about their club on the AACA including one-click access to email forms for accessing club leaders, for displaying news feeds, accessing photo/video libraries, and other functions. -- Additionally, All Clubs who wish to maintain a site will be responsible for the development and maintenance of their own websites at the Clubs expense. The AACA as developed specifically as a club to provide access to website creation/maintenance resources at no expense to the clubs for basic sites, and minimal expense for advanced features. No technical experience is required. If one can do online shopping are peruse social media, they are fully equipped to create a club website and maintain the content and structure of the site. Ken Gorman is currently conducting meetings with groups having similar topics (e.g., the various dance clubs) and, with the HOA announcement in the open, will be conducting meetings open to all club leaders to introduce the system and provide guidance on how to go about the process of creating their online presence. Q&A sessions and demonstrations of AACA features will be held from time to time. The AACA imposes no policy restrictions on clubs. Matters regarding agreements, waivers, advertising, etc, are between the HOA and clubs. For more information as to getting started with your websites, contact Ken Gorman at ken@keligo.com. The next step is to email all the primary club leaders the ClubID and ClubPassword so they can edit the current information for those clubs already listed on the AACA site, and to start up club listings for those not currently on the site. A separate email will be issued to each primary leader because the logon credentials are different for each club. This process will begin in a few days. In the meantime, everyone -- club leaders and SBR residents in general -- should be familiarizing themselves with the site and creating accounts for themselves. It's not necessary to have an account to use the site, but members will have additional benefits. 3. The AACA is itself a club (aka association) having membership open to all SBR residents. First, it's important to point out it has all the features of the release that's being retired, and presented in the same form. You will quickly recognize the array of club tiles and the Browse By Category section. 1. Residents who become members of the AACA can create their own online presence for their clubs without having to consult with anyone. The HOA is no longer in the loop for giving permission to have a club site. The only get involved if you use HOA facilities because they require a release of liability. Even then, you do not have to wait to get your club online. In other words, the HOA and the clubs are fully independent except for the waiver it you use HOA facilities. The HOA establishes no rules as to the content of your site. 2. Club officials who are members of the AACA have the ability to post items on the AACA all-clubs-news feed viewable in real-time by all SBR residents that offers more posting options compared to the Weekly Reminder email including videos and links to points of interest. No longer do residents need to wait for a weekly updates; items of interest can be posted at any time and be immediately viewable. People can also register for email alerts to be receive notifications when new items are posted, eliminating the need to frequently visit sites to make sure they aren't missing important news. 3. The brand new "Express Site Access" feature monitors your club site selections fro the tile array and posts your six most recently visited sites conveniently located at the top of the page. This feature will substantially if not completely eliminate the need to search for the a club tile in the array of tiles for those who tend to access a small number of sites. Furthermore, clicking a tile in the Express Site Access section will take you directly to the club's website. Yes, one-click express access to club sites. To see more about the new and upcoming features, go to the Log In page where you can find the benefits of membership. - The membership sign up feature is not yet installed. Until that is implemented, persons cannot start up a club site. This is top priority. - The Chat room is incomplete and not currently functional. - The webmaster access feature is broken. - The email alert system for postings on feeds is being re-evaluated to offer auto opted-in service. Meanwhile the current system using Google's Feedburner will continue. Once the membership sign-up feature is ready, all club officials will individually be sent emails providing them their sign-up credentials. If you have questions or wish to report problems or suggestions, please email them to Ken Gorman at ken@keligo.com. If you are one of the officials listed for a club, please contact Ken Gorman (ken.gorman@me.com) to get your userID and password that will enable you to upload a tile, add widgets, edit your club description, and make other additions to your listing when those capabilities are added--very soon. I will happily participate in your brainstorming or reviewing your plans in the order in which I receive requests. Even if you already have started this process, such a session might lead you to some better decisions. I will not "push" SBR clubs solutions, but I will definitely help you understand where the SBR Clubs is going regarding features that currently and those on the horizon (how about interactive video conferencing including desktop document sharing) so you don't overlook some opportunities. Contact me at ken@keligo.com . Clubs will no longer need to meet with the HOA as far as this SBR Clubs website is operated. New clubs can start up their listing here on their own, just be entering parameters (choices) into a form, without seeking approval from anyone! Check back here for updates, or better yet, register for alerts so you receive an email notification whenever something new is posted. Before the information for clubs now in SBR Clubs 2.0 can be expanded and widgets can be put to work, as well as before clubs not yet in the system can be added, the "method" for club COs to enter the information must first be developed and tested. Club COs are responsible for the content itself and for entering it onto the site. It will be simple, based on forms. That having been said, two new clubs (Illinois and Woodworkers) will be added early on as part of the development process. Please be patient as this new SBR Clubs 2.0 website comes together. This is a good time for all clubs to determine what they want for the content to appear on SBR Clubs, and determine how certain widgets might be beneficial for their clubs. There are quite a few choices. I (Ken Gorman) am available for consultation on those matters. Prior to this change, one method was provided for finding a club of interest. That method was to select a section of clubs based on the Club Category. Typically the category is obvious, but there can be cases not so obvious. For example, a person's hobby can be to produce works of art. Do you look into "Hobbies" or "Art & Technology"? This method works well for people who are not yet familiar with the clubs at SBR. But for frequent users, the extra navigation can be an inconvenience if not outright irritating. What's being introduced now is a "Quick Pick" method that offers a shortcut for those who are familiar with the clubs, especially the handful of clubs that the participate in. With this method, the club graphical icons are immediately presented to the site visitor (always in alphabetical order of club name). Just clicking an icon will open the SBR Clubs listing for that club. Repeated selections of icons will repeatedly show the listing for the seletion. SBR Clubs 2.0 is now the new landing page for all HOA Clubs/Groups/Activities (which we refer to generically as clubs). This is version 1 that supports all the existing clubs as presented on the previous "tile" version of the site. This new site is more like a directory with features attached to listings in the directory as chosen (or will be chosen) by club leaders appropriate to their needs. Please report any issues to Ken Gorman by going to the Contact page (use the "More" drop down list to select "Contact Webmaster". SBR Clubs 2.0 Update, May 15, 2018: All clubs sites are "in place"
At this time, all clubs known to me are included on the new pre-released SBR Clubs 2.0 site. This includes sites from the current site, clubs registered with the HOA, and a few sites that are expected to be registered with the HOA very soon. If not registered at the time of release, those sites will be automatically disabled from appearing. The sites that are not currently registered are indicated by "Coming Soon" immediately preceeding the club name. Clubs with a maroon square in place of a graphic simply indicates one does not yet exist for that club yet. I will be implementing a feature wherein the club owner or delegate can upload the graphic. The website will automatically re-size it. Instrutions will be available when the feature is ready. When will I cutover to SBR Clubs 2.0? Probably next week, giving those who currently have a presence on the current site a chance to check over their new listing. We need to make sure persons referenced as contacts (CO: chief officer, AA: admin assistant, ST: secretary/treasurer) are included and are correct -- assuming the club has AA and ST positions. The CO position is required for all clubs to be listed on the site. The recently announced SBR Clubs redesign -- SBR Clubs 2.0 -- is well underway, with Phase 1 completed today. All clubs/groups/activities (collectively referred to as "clubs") that are present on the current SBR Clubs website are up and running on SBR Clubs 2.0 (aka "Clubs"). All other clubs "recognized" by the SBR HOA are also represented on Clubs but are incomplete, and are marked "Coming Soon". And there are a few clubs included that are not yet even known to the HOA as they are so new. Phase 2 is all about completing the work to get those clubs properly included. And Phase 3 is about getting service "widgets" installed; more about that below. Club officials need to review what's presented on the Clubs website ASAP and provide feedback to the Clubs webmaster (Ken Gorman) with corrections and additions. And to get their club formed with the HOA. The work includes the (1) club chief officer (CO) meeting with the HOA Admin (Dani Herbert) to review plans, to set up the club using a minimal set of information provided by the club, to receive a password provided by the HOA Admin, and to make sure any paperwork required by the HOA is completed, and (2) using the provided password, a person designated by the CO entering more detailed information about the club. The SBR Clubs Webmaster is available throughout this process to facilitate the process. With this re-design, clubs will be free to choose how they want their club represented without dependency on the Clubs Webmaster. Regarding individual club websites, those that already have a website can continue to use it without any changed being required, and will continue to received support of the Clubs Webmaster per commitments.. Or clubs may prefer to develop a website on their own. Some options are extremely simple and although restricted in terms of features. At the other end of the spectrum, clubs can have strongly featured and glamorous websites. In a follow-on posting here, some example alternatives will be described. Finally, many clubs may discover, based on the built-in services of the Clubs page, that a website is not even needed. The Clubs website has integrated in the ability to describe your club, to include contacting the club using built-in email forms, to connect to online documents, to access photo galleries, to access videos and video channels -- in short, cover all the needs of some 80% of the clubs. The widgets for those services are not yet included. Check back to this feed for updates; better yet, register for email alerts to be notified when new items are posted here. Click Register for Alerts. Club Representation in this Clubs Website, the "Home of SaddleBrooke Ranch Clubs"
Is your club represented on this Clubs Website? If not, the community may not know your club exists! 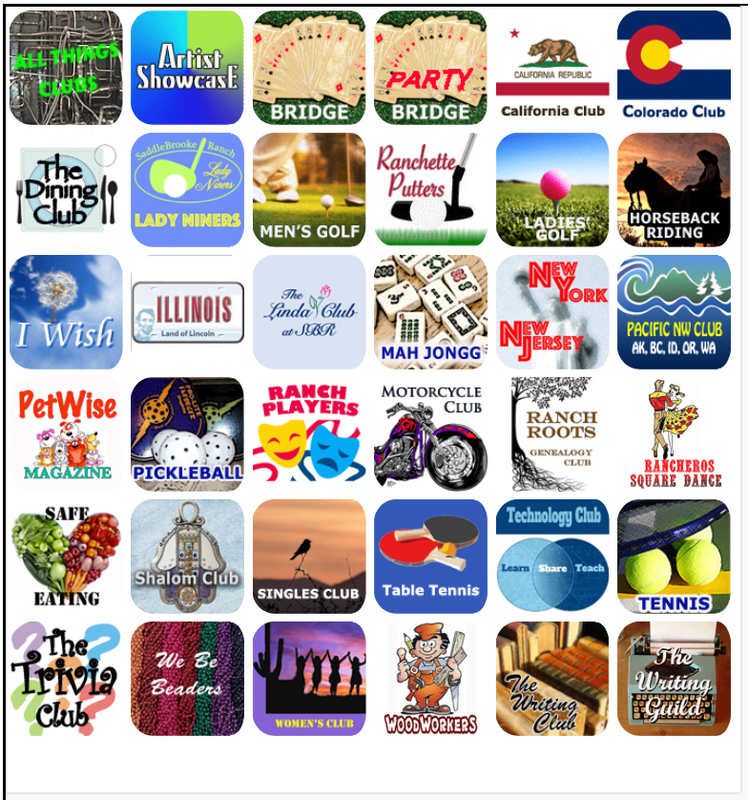 Remember, the HOA website connects to this website for all-things clubs (notice the "Clubs" tab in the menu bar.) Click here for additional information plus a form to contact Ken Gorman for adding your club. Whether you want a minimal statement of your club or have special needs like a directory and a membership tool, your club will benefit because of the eyeballs coming to your site. Also, those clubs that are represented here can having postings on this feed about topics of general interest to the whole community -- like festivals, exhibitions, auctions. If you are working to expand your membership, this additional (free) exposure can pay dividends. See the amazing variety of terrific art by SBR residents. More have been added since the 2015 Art Walk. Are you an artist and would like to he showcased on the Artist Showcase -- for free? Click "I need information" and learn all about it. This Clubs website is now known as: The Home Of Saddlebrooke Ranch Clubs. Do you have a club that you'd like represented on the site -- for free? Go to The Home of SaddleBrooke Ranch Clubs and open the "Add You Club or Community Activity" drop down. "We Be Beaders" is the latest addition to the clubs lineup at The Home Of SaddleBrooke Ranch Clubs. The Ranch Riders club is rev'ing up and gaining traction. Interested in riding with members to interesting places? Check out the club site and contact them about membership. The Women's Club is an expansion and replacement of the previous Birthday Lunch Club. Go to the Tennis website, click the "More" button, then click the Photo/Video button and select the "Second Annual Steins Tennis Festival 2015". A one hour horseback, or a short wagon ride, are offered followed by a delicious dinner buffet and dessert around the campfire. There is a cowboy singing during dinner, line dancing after dinner, and an open bar. There is also an option for the dinner buffet only. Click item title for more information about this Horseback Riding Club event. Description of the club to be added, but you can use the email form to contact the club leader. Found a bug? Have a question or suggestion? Contact Webmaster! If anything appears to be a bug or something seems wrong or confusing, or if you have a suggestion for improving the site, contact the webmaster. To do so, click the "Contact Webmaster" menu item in the purple column on the left side of any page. Artist Showcase now presenting 20 terrific artists and their art samples! Are you an SBR artist? Twenty artists now have images of samples of their terrific work presented on the Artist Showcase. We look forward to adding more artists as they discover the site, and as more artists move into the community. Image the impact of this website as the community grows over the years. Please tell your artist friends to check us out. There is no cost to anyone -- that's right, this website is offered for free. If you are an artist residing at SaddleBrooke Ranch and would like to participate, click "I'm an artist" to open the website, then click "About the Showcase" in the footer section of the page to open a document that explains this artists' "collective" and provides the means to submit a request to participate. This feed will present news about SBR clubs: News about clubs being formed, special club news of community-wide interest, special events for the community sponsored by clubs, etc.